This spring, we are planning a super secret surprise trip, and I cannot wait to tell everyone! Hopefully we can finalize all the details and spill the beans here around January. 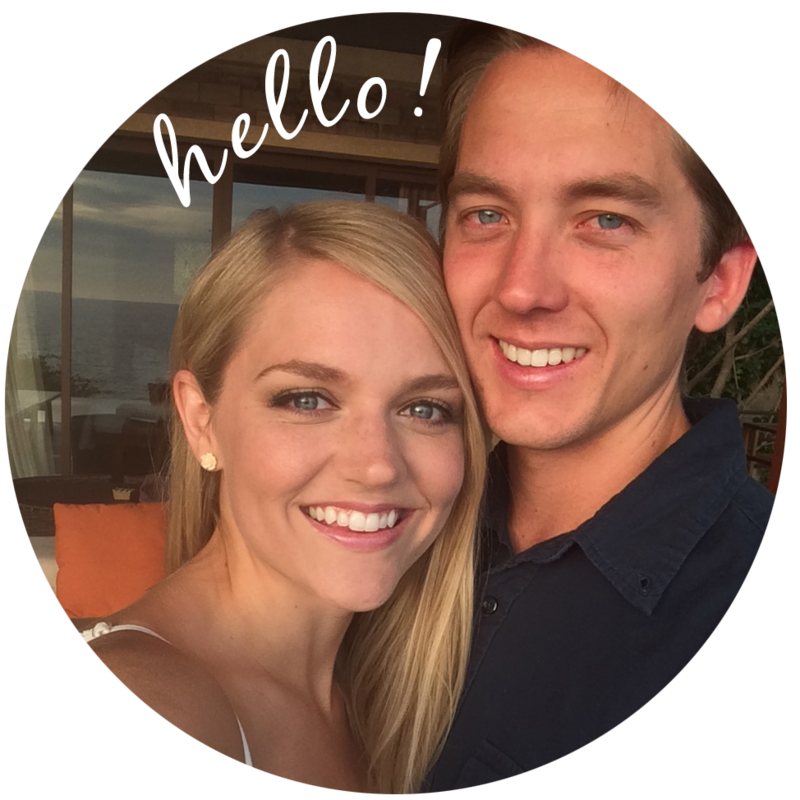 That was Alexis in our “Expat Update: 6 Months in Thailand” post from a few weeks ago. So you wanna know where we’re going and why it was a surprise? We’re so excited! Both because we’re going to Japan (obvi) and also because it will be an awesome family experience! My dad, step-mom, two older brothers, and us (that’s like six Roses on the Road right there… whoa) will be exploring the country from Sendai up north to Kumamoto in the south over two weeks in April. That’s prime time for cherry blossoms! 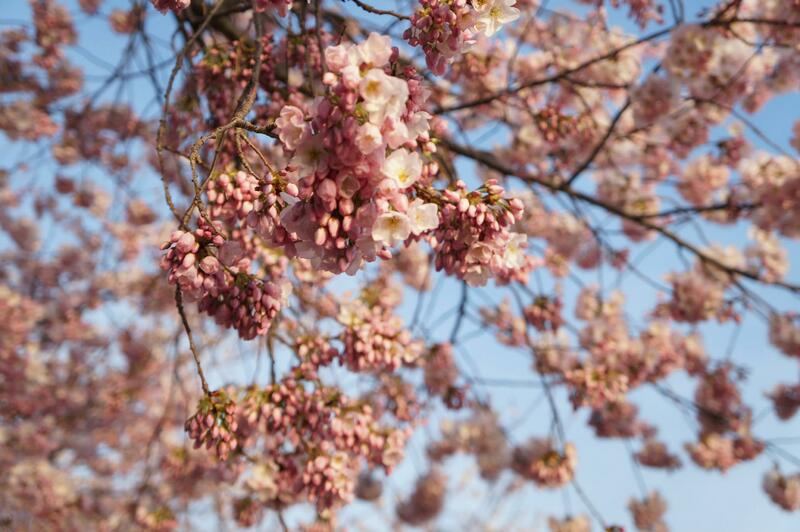 We LOVED the annual cherry blossom bloom when we lived in DC and cannot wait to see them in their homeland! Perhaps part of the reason Alexis and I live to travel is because the examples both of our dads set for us. Neither of them were extensive travelers by any means, but both previously lived abroad before getting married and starting families, my dad in Japan and Alexis’ in Germany. For some time Alexis and I have wanted to take our dads back to those places. We dreamed of getting a peak into their past by having them show us places they used to frequent and hearing stories of their time abroad. It’s such a cool thought thinking of them like we are today — young adults out in the world, blazing their own path, stretching boundaries, and discovering themselves. It look a lot of planning, but it all worked out… We got him so good! It’s a Christmas surprise! 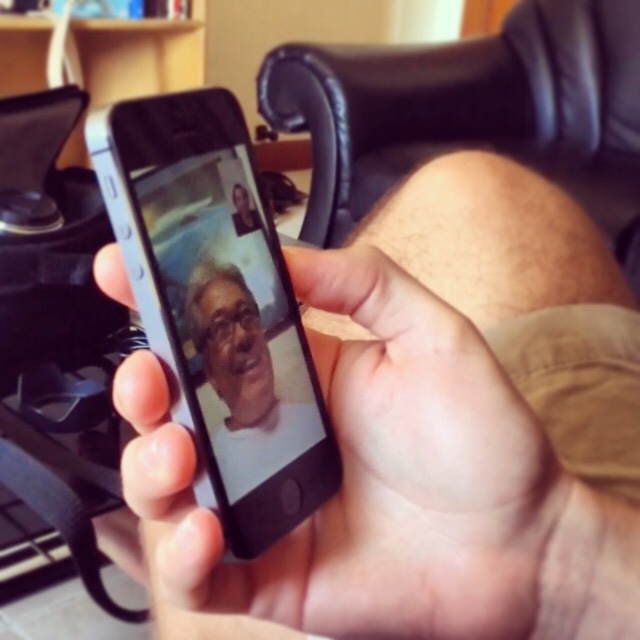 From Thailand to Hawaii, FaceTime brings families together on the holidays. We ‘aint rich. When it comes to travels of our own or gifts for family, we use miles to fly for free. Earlier this year, we cut $300 from a trip to Borneo, Bali, and Southern Thailand using miles, but we did one better this time. Not only did we pay for our own flights from Chiang Mai to Sendai using miles, but my dad’s flights to and from Japan as well. Alexis and I took advantage of a United Airlines sale that lowered the price from Thailand to Japan from 22,500 miles per person to 20,000. We got those miles from the Chase Sapphire Preferred card. My dad and step-mom are flying direct from Honolulu to Sendai on Hawaiian Airlines for 25,000 miles each and flying home from Kumamoto on Asiana Airlines for another 25,000 each. The return flights were also booked with miles obtained from the Chase Sapphire Preferred card while the Hawaiian Airlines flight was booked using American Airlines miles obtained through a combination of the Citi/AAdvantage Platinum Select MasterCard and the AMEX Starwood Preferred Guest card. I recommend reading this post from MileValue.com to better understand the above. A potential sticking point with gifting miles that we avoided was getting two people on the same flight when only one of them is receiving a gift. We would have loved to gift both my dad and step-mom a free flight, but that’s unfortunately a little out of our reach. The problem then is, the cash value of the exact same flights my dad is flying would have been way higher than simply going on Kayak or Skyscanner and buying the cheapest flight. We avoided this by simply having my brother, who’s almost just as big a mile collector as I am, book our step-mom’s tickets using the same miles I used for our dad. He simply booked a ticket in her name using his miles and then she paid him the cash value of what a roundtrip flight to Japan would have cost. 1. You can make some side money by helping loved ones out. I made money because my brothers contributed to my dad’s free flight, not with miles, but with cash. Those miles cost me nothing, but we made up an ambiguous 1/3 cash amount and they each paid me that. My brother made money by helping our step-mom get on the same flight as our dad. Instead of buying a ticket through Kayak, she bought it through my brother instead. A roundtrip flight from Honolulu to Tokyo is around $800. We wanted to explore the whole country though, moving north to south. Booking a roundtrip ticket from Honolulu to anywhere in Japan would have meant a long train ride back to our point of origin in Japan in order for them to get home. In cash, a one-way flight from Honolulu to Sendai is around $700, and around another $700 from Kumamoto back to Hawaii. $1,400 versus $800 is enough for most people to abandon that plan. But that’s exactly what we were able to do with miles. It would have been 50,000 miles for a roundtrip flight from Hawaii to Japan, but you also have the option to book two one-ways for half the price. He is my inspiration for Travel. Thank you! We were originally planning to do it over Father’s Day as well, but the timing ultimately worked better for in April. Definitely would the perfect time to do something special though!